Episode 149: Govts Suspending Gun Rights During Protests? Topic: Governments Suspending Gun Rights During Protests? Riley and Jacob cover this week's stories from legislative updates to our usual JUSTIFIED story segments. This week in the news, Oregon has just passed a ridiculous law that you're not going to want to miss out on learning about because trust me, this one amounts to gun confiscation…and it's coming your way! Also good news out of Ohio that strengthens self-defense laws and rights. Plus don't miss the story about a man that is burglarized and attacked by 3 violent teens and what he had to do to defend himself and his family from a gun! Hit the ‘PLAY' button and listen in now!! 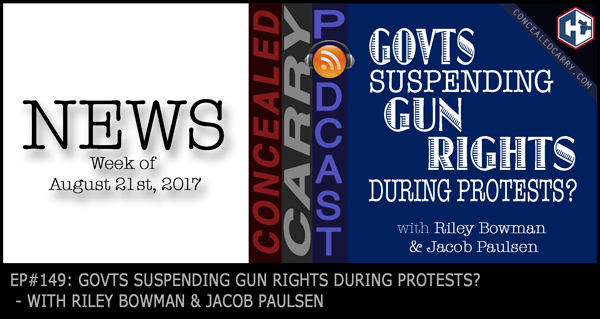 3 Responses to Episode 149: Govts Suspending Gun Rights During Protests? I have enjoyed your podcast and learned a lot as I’ve listened over the last few months.I want to comment on episode 149 where you were discussing the federal requirements for transporting a firearm. I feel that A couple of your comments were missed leading or may be incorrect. In my home state of Virginia it is legal to transport a loaded firearm in a latched compartment, with no requirement to be locked. This applies to both concealed carry and open carry. You also used the example of going to the post office and locking your weapon in the safe in your vehicle. The US appeals Court clarified a couple years ago that the parking lot is considered part of the post office and no weapons are allowed there, and the Supreme Court will not be taking up the case. I wouldn’t want to see someone get in trouble for that one. I May be completely wrong but I wanted to give you my opinion just in case I’m right. Charles, thanks for the comment. In a previous episode where we talked about interstate travel we clarified the details on 926A of FOPA. Individual states like Virginia can have as lenient policies as they want related to transporting firearms but FOPA ensures a minimum right to transport a firearm regardless of state laws. So in Illinois for example despite the local laws 926A allows that one can transport a firearm as long as it meets the requirements. In Virginia however 926A is fairly pointless since the laws are more forgiving/flexible than the federal minimums. Hope that helps on that one. Related to the Post Office the court case you referred to was here in Colorado and Riley and I are very familiar with it. If we failed to clarify those details in a comment we made then we need to rectify that on an upcoming podcast episode. As you noted parking lots are clearly off limits now (at least in that federal district) so when we spoke of locking up the firearm at the post office we should have specified that one needs to park offsite also. Thanks for following up! Indeed, and this is an important distinction. A large portion f the Virginia population lives near Washington, DC, and Maryland which are covered by FOPA but where one needs to pay attention to federal securing laws — and understand reasonable and necessary stops as well. In DC, like Massachusetts, a constituent part of ammo that can be used to create more ammo is ammo. In other words, centerfire ammo expended brass is ammo. A 9mm casing under your seat may not be covered by FOPA.